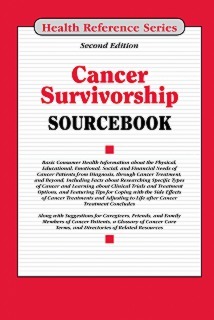 Cancer Survivorship Sourcebook, Second Edition, provides information for cancer patients and their family members, friends, and caregivers. It includes tips for researching specific types of cancer, treatment advances, and clinical trials, and it offers suggestions for coping with the side effects and complications of cancer treatments. Facts about emotional, cognitive, and mental health issues in cancer care are included, and a special section focuses on the challenges of maintaining wellness during and after cancer treatment. A glossary of cancer care terms is also provided, along with a directory of resources for cancer patients and information about financial assistance for cancer care. It also includes access to Health Reference Series Online. Part I: If Your Doctor Says It’s Cancer begins with information on who cancer survivors are and follows up with information of immediate concern to the newly diagnosed cancer patient. It describes the process of finding a qualified healthcare provider, cancer screening, diagnostic procedures, understanding the diagnosis and getting a second opinion. It provides facts about the tests that are used to diagnose cancer and to monitor the effectiveness of cancer treatments and concludes with the cancer statistics in United States. Part II: Making Treatment and Cancer Care Decisions provides an overview of commonly used cancer treatments, medications, and complementary and alternative medicine (CAM) practices. It also discusses the use of palliative and hospice care, and describes the transitions that may occur during care if cancer treatments are not effective in halting the advance of the disease. Part III: Clinical Trials and Cancer Research Updates provides information for cancer patients who are considering participating in cancer-related research studies. It explains the procedures commonly used in clinical trials and explains how to locate one. It also offers updated information about recent research results, new treatments, and current research initiatives that offer hope for the future. Part IV: Coping with Side Effects and Complications of Cancer Treatment discusses side effects that often accompany commonly used cancer treatments. It explains why treatments can cause such physical effects as nausea, vomiting, weight loss, hair loss, and fatigue. It also includes practical suggestions for dealing with these types of effects and other medical complications of cancer treatment. Part V: Emotional, Cognitive, and Mental Health Issues in Cancer Care provides facts about the non-physical effects and complications of cancer and its treatment. These include changes in self-image that result from illness or from body-altering surgical procedures and the ways people adjust to new circumstances. It also describes mental health disorders that may accompany cancer treatment, including depression, anxiety disorders, posttraumatic stress disorder, and substance abuse. Part VI: Maintaining Wellness during and after Cancer Treatment describes various steps cancer survivors can take to achieve optimal health while they are receiving cancer treatments and after their treatments have been completed. These include eating a healthy diet, participating in rehabilitative programs, exercising, and smoking cessation. Additional chapters address concerns related to resuming normal life once cancer treatment is over and appropriate follow-up care. Part VII: Information for Friends, Family Members, and Caregivers gives an overview of family issues after treatment, offers guidelines for dealing with family matters, life planning, and practical aspects of cancer caregiving. Individual chapters address specific concerns of loved ones, parents, children, and siblings. Part VIII: Additional Help and Information includes a glossary of cancer care terms and a glossary of terms commonly used by health insurance companies and in medical billing. It also offers directories of resources able to provide services and support to cancer patients and their families.